Gjafapakkning Til hamingju með afmælið, framleitt í takmörkuðu upplagi. Inniheldur sérmerkta Volvik Vivid bolta + húfuklemmu og boltamerki merkt með Happy Birthday. Give the gift of golf, with this highly visible special edition themed golf ball, in a beautiful presentation box. This is the worlds first ever matte finish golf ball and provides better visibility to help you locate your golf ball much more easily. The ball has been formulated to add more distance for slower swing speeds, and provides a more stable mid-high ball trajectory ball flight for increased accuracy off the tee. For more control the ball has a soft feel for improved feedback and has high spin for extreme short game accuracy. Special Edition Pack (4 balls with ball marker & hat clip). 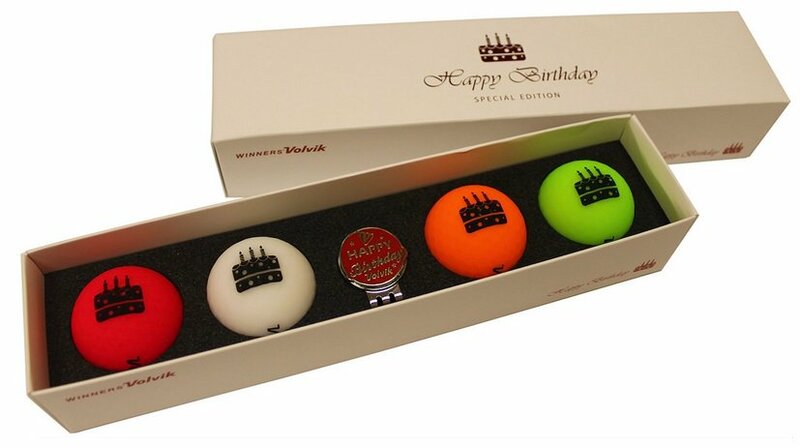 The famous Matte Finish golf in a Happy Birthday presentation pack featuring Cake with Candles. Longer Distance on Low Swing Speeds (70-90 MPH). Consistent & Accurate Green Control.